Voila. We Belgians can also be proud of the Hercule Poirot phenomenon in addition to our world-famous beers and chocolate. Probably the best detective in the world. And yes, he comes from this tiny country in Europe. The fact he’s actually a fictional person created by Agatha Christie, we forget for a moment. This vain, anything but modest, equipped with an enormous mustache, ingenious Belgian detective has already been played by a whole series of actors. But for me, it’s David Suchet who lived up the most to the image of Poirot. What to do to make a well-known story interesting? What should you do when making a film of a world-famous book by Agatha Christie and you know in advance that a large part of the audience knows the story and the ending already? Well, the best thing you do is to gather a star cast and using the necessary digital magic tricks to ensure a wow effect. Whether this is sufficient for most moviegoers is a question for me to know and for you to find out. However, I wasn’t that impressed. Ok, the first bird’s eye views of an Orient Express cutting through the landscape and those swirling camera movements in the snow, look breathtaking. But that’s obviously not interesting enough. A lot of well-known stars. So, after the introduction of Poirot (Kenneth Branagh), who got an overwhelming mustache, one can calmly reel off the list of familiar faces. And those are certainly not the least. Judi Dench, Johnny Depp, Michele Pfeiffer, Daisy Ridley, Penelope Cruz, Willem Dafoe, Derek Jacobi, Olivia Colman, and Leslie Odom Jr. are introduced one by one. And then we just have to wait for the train to set off and someone is killed, after which Poirot can start sniffing around for the killer. Fortunately for him, a fresh avalanche causes a delay in such a way that he can unravel the exciting mystery before the authorities arrive. Let’s hurry because there’s lots to work through. Exciting? Well, not for me at least. I’ve never been a big fan of classic detective stories like those of Sherlock Holmes and consorts. I always thought it’s a bit stiff and not really entertaining. Or it must be such a beautiful film as “Mr. Holmes “where the retired detective tries to solve a final case at a leisurely pace before his memory completely abandons him. 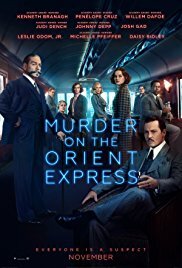 In “Murder on the Orient Express” there is no sluggish pace because all suspects on the train must be analyzed by Poirot and provided with a solid motive. And all in just under two hours. That is a lot to show in such a short time frame. The intro, the introductions, the murder, the investigation and then the announcement of the perpetrator. And all this interspersed with stylized images of both the interior and the exterior. It sometimes felt rather hasty. Perhaps you’ve lived under a rock and never heard of Agatha Christie and this world-famous story. In that case, you should definitely give this movie a chance. Is it worthwhile for others to take the trip to the cinema? Well, if you want to admire the general splendor of the Orient Express, then you definitely should do this. And furthermore, the grotesque, oversized mustache of Branagh will certainly leave an impression. For me, they can come up with an extra category for the Oscar award ceremony. That of “Oversized decor pieces”! A great cast that quickly ran out of steam causing a good original idea to fall off the tracks.